The design of the whole building is so striking because of its curves. Before you enter, stand across the street and look at how the building is different to those around it. Its undulating exterior and stone finish really set it apart. Those curves continue inside. Most of the rooms don’t have any straight walls at all! Inside you’ll find a museum which allows you to see what the apartments would have been like in Gaudi’s time and an exhibition room. Most importantly though, this allows you access to the incredible roof. This will be the highlight of your visit. There are great views of Barcelona, and the most incredible feature chimneys you have ever seen. Nobody designs chimneys like Gaudi! La Pedrera is open daily in the winter from 9am – 6.30pm and in the summer from 9am – 8pm. Adult admisson is 16.50 Euros per person (2013 prices). 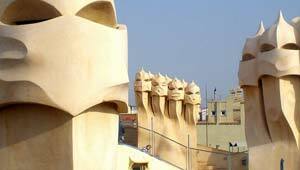 La Pedrera is one of the stops on the top-rated Barcelona Half Day Sightseeing Guided Tour. There are also now a number of additional night-time activities at the building including a tour with dinner. At peak times, expect to queue to get in unless you have purchased tickets in advance. La Pedrera (Casa Mila), Passeig de Gracia 92, Carrer Provenca 261, Barcelona, Spain.